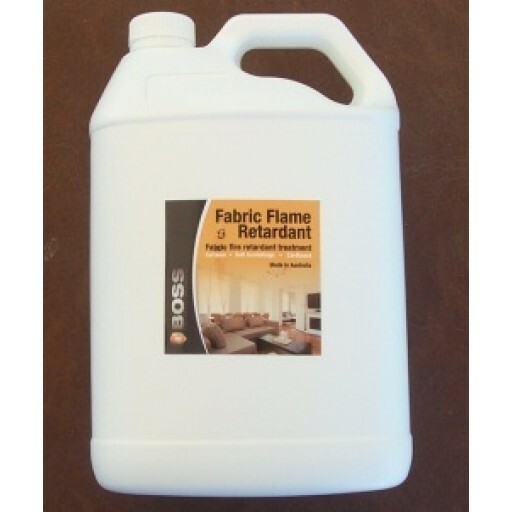 BOSS Fire's FABRIC FLAME RETARDANT is a colourless liquid consisting of water and inorganic salts that render a fabric or water absorbent material flame retarded when dry. BOSS Fire's FABRIC FLAME RETARDANT is a colourless liquid consisting of water and inorganic salts that render a fabric or water absorbent material flame retarded when dry. The product is environmentally friendly, has a faint odour during application but no odour when dry. The product does not cause marked levels of stiffening or discoloration of the fabric where application instructions are followed. Normal precautions are strongly advised, such as testing on an unobtrusive portion of the material prior to application. Fabric Flame Retardant is designed to "fire retard" NOT fire proof. It is best used on fabrics that have a percentage of natural fibres rather than synthetic fibres. If the fabric to be treated has a high percentage, or 100%%, of synthetic fibre content, contact Trafalgar Fire & Safety on the details below for further advice. We strongly recommend you do not apply Fabric Flame Retardant until contact has been made. The method of application is dependent upon the type of material and the structure of the fibre to be protected. The quantity of FABRIC FLAME RETARDANT required depends on the absorbency of the material, its inherent flammability and its overall weight. The only role of FABRIC FLAME RETARDANT is to act as a flame retardant. Fabrics to protect the public and property against accidental ignition or arson. Ideal for use throughout the home. Do not apply to fabrics with a high content of synthetic fibres.